Based on the observations of researchers in learning social studies found that students were less active in the learning process IPS. Students are less interested in social studies because during social studies only considered as subjects only rote and less emphasis on affective and psychomotor aspects. Teacher-centered learning, teaching methods are less effective, do not use the lesson plan (RPP), do not use the medium of learning, students are less given the opportunity for creativity, students are not encouraged to find a concept but indicated concepts to keep in mind, students easily forget what who had previously remembered because learning is limited to reading a book or listening to an explanation. Consequently the results of social studies is very low, of 33 students, who thoroughly studied only 14 students of completeness criteria 65. Thus, researchers conducted a study to solve these problems. The purpose of this study were (1) Describe the application of the method of problem solving with the media image series in improving learning outcomes in teaching social studies for class IV SDN Turi 01 Town Blitar, and (2) Describe the improvement of learning outcomes in teaching social studies for class IV SDN Turi 01 Town Blitar. Data collected by observation, observation, document, and test. Results of the study are: (1) an increase in activity of student learning through the application of methods of problem solving, (2) an increase in student learning outcomes through the implementation of the application of problem solving methods, and (3) of 33 students only one of students who have not completed thereafter learning activities for two cycles because of relatively slow learning students. Arikunto, Suharsimi. 2007. Penelitian Tindakan Kelas. Jakarta: PT Bumi Aksara. Fathurrohman, Pupuh dan Sutikno, Sobry. 2009. Strategi Belajar Mengajar Melalui Penanaman Konsep Umum dan Konsep Islami. Bandung: Refika Aditama. PERMANA, Erwin Putera. Penerapan Metode Problem Solving Dengan Media Gambar Seri Untuk Meningkatkan Hasil Belajar IPS Kelas IV Sekolah Dasar. JURNAL PENDIDIKAN DASAR NUSANTARA, [S.l. ], v. 1, n. 1, july 2015. ISSN 2579-6461. 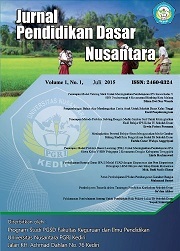 Available at: <http://ojs.unpkediri.ac.id/index.php/pgsd/article/view/152>. Date accessed: 25 apr. 2019. doi: https://doi.org/10.29407/jpdn.v1i1.152.